Waterhouse’s marriage of detailed figures and hazy landscapes was highly commended throughout his lifetime, and he remains one of the most influential figures in the art world today. About the artist: John William Waterhouse (1849 – 1917) was an English painter known for embracing the Pre-Raphaelite Brotherhood’s style and subject matter. His artworks portray women from both ancient Greek mythology and Arthurian legend. Waterhouse was born in Rome to English parents, also painters. He later moved to London where he enrolled in the Royal Academy of Art. He displayed work in their annual summer exhibitions, the large-scale canvases depicting scenes from both daily life and mythology of ancient Greece. Waterhouse’s work is currently displayed at several major British art galleries, and in 2009, the Royal Academy of Art organised a retrospective of his work. One of his best-known subjects is The Lady of Shalott, as depicted in the 1832 poem by Alfred Lord Tennyson. In January 2018, curators at Manchester Art Gallery caused a public uproar by removing an 1896 Waterhouse painting, Hylas and the Nymphs, from public display. It was restored after only a week’s absence. 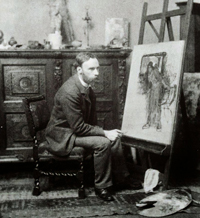 Waterhouse died in 1915, leaving a series of paintings unfinished. His grave can be found at Kensal Green Cemetery in London.